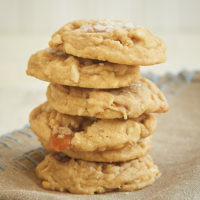 It’s been far too long since I shared a cookie recipe here on BoB. They’re one of my favorite things to bake, so you know it will never be too terribly long between cookie recipes. And let me tell you, I’m diving back into cookiedom in a big, big way. These chewy, nutty cookies combine two favorites – cashews and caramel – with a salty bite. 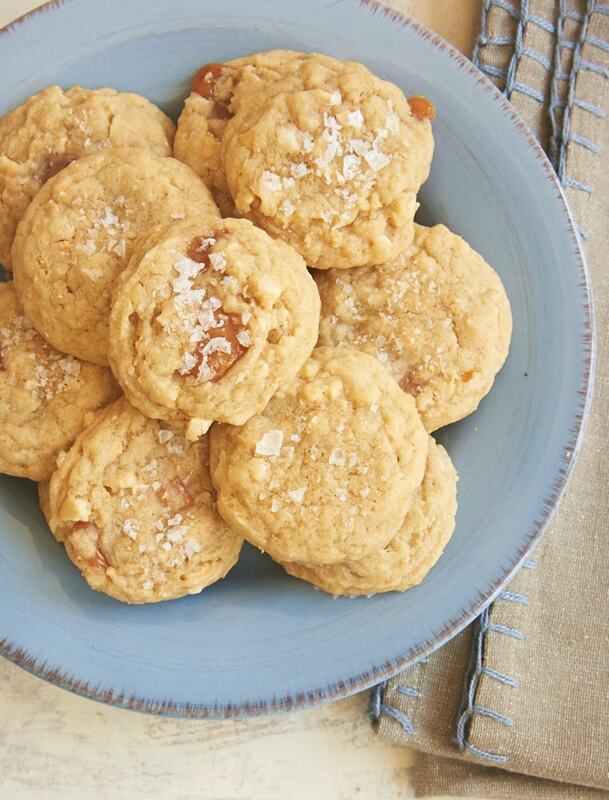 If you’re a sweet and salty fan like I am, then you’re going to adore these cookies. 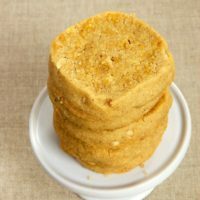 A little pinch of salt on top of these cookies adds so much flavor. While regular table salt is great for baking, coarse salts have many uses, too. Many of you probably cook with kosher salt, which is a type of coarse salt. I prefer sea salt for topping recipes like this one. It adds that wonderful salty crunch and really stands out on the cookies. Most any sea salt will work, but I usually keep a small box of Maldon sea salt on hand for just this kind of thing. 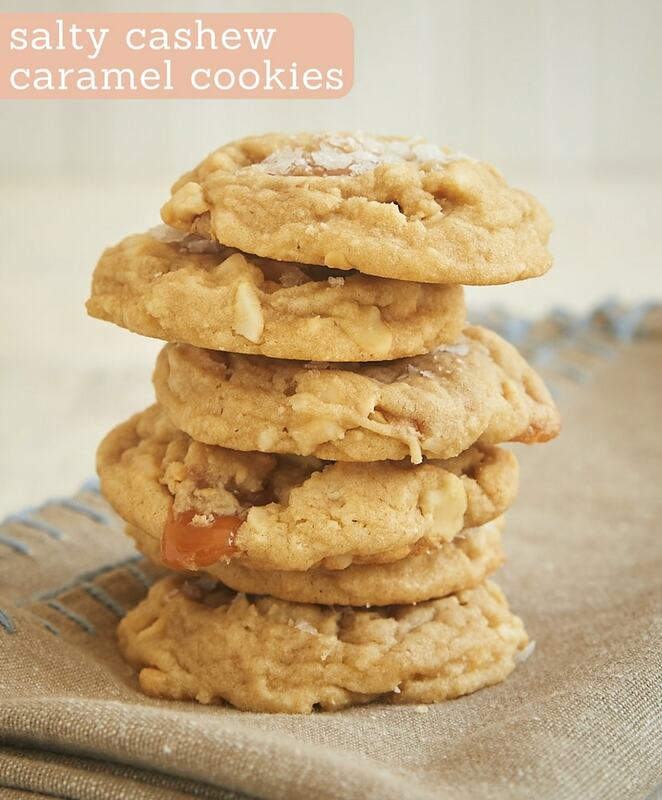 If you have access to caramel bits, they’ll work well in these cookies. If not, regular soft caramels will certainly work. You’ll just need to cut them into small pieces. I usually cut them into about 9 pieces, but you can cut them even smaller if you like. Smaller pieces means that the caramel will be better distributed among the cookies. This recipe makes a big batch of cookies. I prefer to make them using 1 tablespoon of dough per cookie, but you can use 2 or 3 tablespoons portions if you want larger cookies. As always, a cookie scoop is your cookie-baking best friend for consistently sized cookies. When your cookies are all the same size, they’ll bake more evenly. 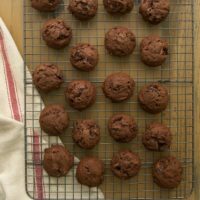 If your cookie craving is for something a bit different, give these sweet and salty cookies a try. The flavors are irresistible! And if your needing cookies for a crowd, you’ll have a whole bunch of happy cookie eaters! 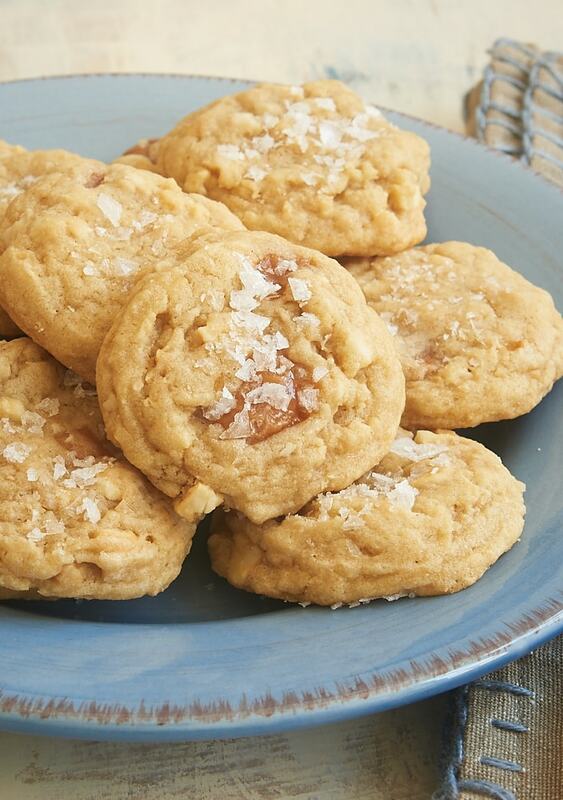 Rich caramel and crunchy cashews add big flavor to these Salty Cashew Caramel Cookies. The sprinkle of salt on top is the perfect finish! Whisk together the flour, baking powder, bargain soda, and salt. Set aside. Stir in the cashews and caramels. Drop the dough by tablespoonfuls onto the prepared pans. * Flatten the top of each cookie slightly. Sprinkle the top of each cookie with a pinch of coarse salt. Bake, one pan at a time, 10 to 12 minutes, or until lightly browned. Cool the cookies on the pan for 5 minutes. Then transfer the cookies to a wire rack to cool completely. *I highly recommend using a cookie scoop for consistent portioning. Unless your kitchen is warm, you won’t need to refrigerate the cookie dough before scooping and baking. I do suggest refrigerating the dough between baking batches to keep it cool. Love the sound of this recipe and I very much want to make these cookies. 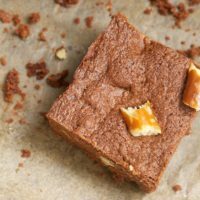 Because there is salt on the top of the cookie, would you recommend still using salted cashews or unsalted. 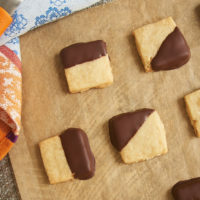 I want to make them this weekend, but do not want to be overwhelmed with saltiness in the cookie as well. 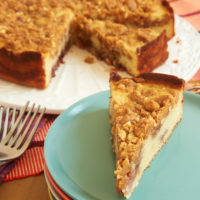 Thanks for sharing another great recipe. Hi, Janet. Either is fine. It depends on your taste. I mostly use unsalted or lightly salted nuts in baking. mmmmm oh my goshhh yesss-sweet and salty for the win! Just made the dough for these! They look great! Thanks for the recipe!! I would like the detailed nutritional analysis for these wonderful cookies — our family’s favorite by far! 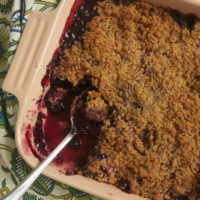 I started using your recipe after Trader Joe’s discontinued theirs. These are much better! Hi, Marcia. I’m so glad you and your family like the cookies! I don’t supply nutrition info as I am not personally qualified to do so. There are several online nutrition calculators that you could try. I’d recommend doing a web search to find one to try.